‘You know how much it means to other people, too, which makes it bigger,' Landstedt says. (Trent Nelson | The Salt Lake Tribune) University of Utah ski coach Fredrik Landstedt produced a national championship team in his first year on the job. Landstedt was photographed at the Spence Eccles Ski Team Building in Salt Lake City on Monday April 1, 2019. The day after the New Mexico board of regents voted to eliminate the university's skiing program last July, Fredrik Landstedt took a job at Utah. The Utes won the combined men's and women's national championship eight months later. This would be a better story if it all really happened that suddenly, with Landstedt storming out of the fateful meeting and heading to Salt Lake City, vowing to win an NCAA title and make New Mexico regret his move. The real-life version is almost as good, though. After applying for Utah's director of skiing vacancy in May, Landstedt arrived in his native Sweden for his father's 80th birthday party and received an email asking him to come for an interview. He immediately booked a flight to Salt Lake City, spent parts of two days discussing the job, then flew back to Sweden and went straight from the airport to the celebration. The process took nearly another month, before Landstedt was offered the job and accepted it — coincidentally, the day after the New Mexico regents’ vote that would end the Lobos’ program after the 2019 season. And then his move became even more life-altering with the Utes’ 12th NCAA championship in the March 6-9 competition at Stowe, Vt., completing a season when the skiers responded well to Landstedt and a mostly new coaching staff. The move to Utah came after Landstedt, 54, spent 21 years on the New Mexico staff, helping win the school's first national championship in any sport as the Nordic coach and then working as the head coach for 11 seasons at the school where he skied in the late 1980s. The news of the potential athletic program cuts — men’s soccer and women’s beach volleyball also were affected — came in 2017, when the ski team received a two-year reprieve, while coaches were asked to fund-raise for half of the budget. So Landstedt had some time to consider his future. 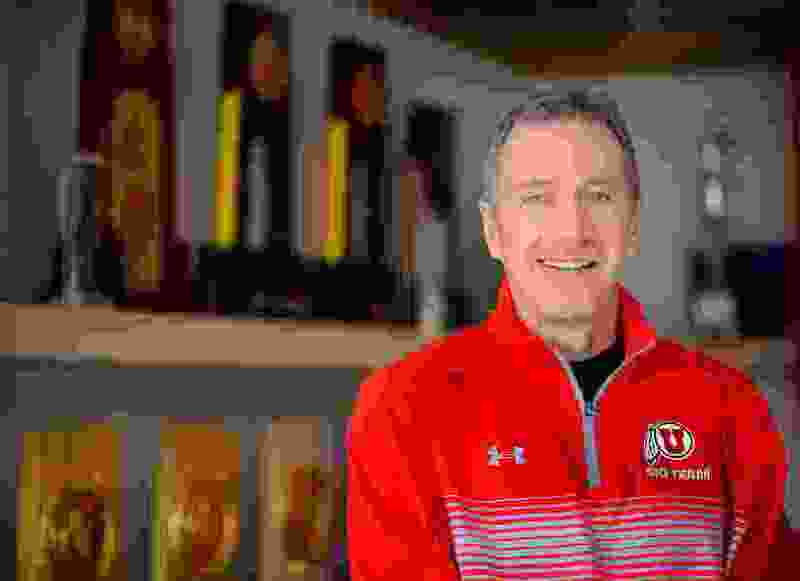 He pursued Utah’s opportunity last spring when former Ute director of skiing Kevin Sweeney resigned, after having won a national title in each of his two stints of this century. The appeal was obvious. Utah is “a team that I know regularly can win championships,” Landstedt said. 1 – Dartmouth, New Mexico, Vermont. He’s saying this, while surrounded by national championship trophies in the conference room of the $2.8 million Spence Eccles Ski Team Building on the Utah campus. The only other schools that ever have won NCAA titles include Vermont, Colorado, Dartmouth, Wyoming, New Mexico and Denver, which has dominated this century with 10 championships. So Utah always will be on the list of potential winners. The Utes came through in March in Stowe, Vt., giving Landstedt a title in his first year after taking a commanding lead into the last of four days of competition. Eccles, a former Ute skier and longtime philanthropist, beamed when the victory was announced during a basketball game that evening. The Utes skiers were recognized two weeks later when the school hosted the NCAA basketball tournament at Vivint Smart Home Arena and will be honored next week during the Red-White spring football game. And the Utes already are looking toward defending their title next March in Montana (Utah will host the 2022 event). With his staff of Nordic coach Mikes Havlick, Alpine coach JJ Johnson and Alpine assistant coach Jeremy Elliott, Landstedt is determined to keep winning championships. At New Mexico, his approach was to “outwork everybody,” just to have a shot at finishing in the top five. “That's the philosophy I brought here,” he said, working in a program that's fully supported. During the dedication of the ski team building in 2017, Eccles mentioned the program's funding level and then-athletic director Chris Hill responded good-naturedly, "If you think I'm cutting the skiing budget, you're crazy." Mark Harlan, Hill’s successor, assuredly will have the same view of the program, after the skiers brought home another trophy. Utah dominated four-day 2019 NCAA Skking Championship at Stowe, Vt.